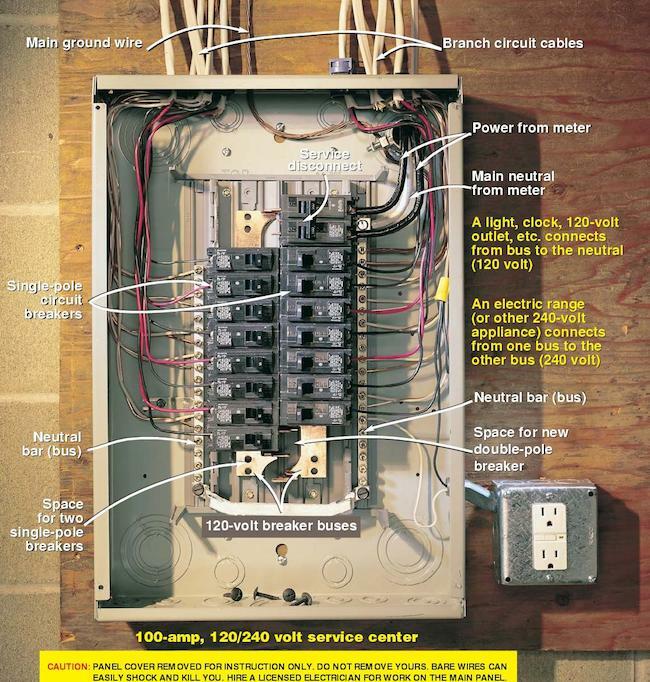 Let's take some of the mystery out of those wires and switches that lurk behind the door of your breaker box. Come along and take a peek with us, but don't touch! In your home—in everyone’s homes, in fact—the seat of electrical power takes an unassuming form. Concealed by a nondescript metal door, the breaker box doesn’t look very impressive, but it’s the reason you can turn on the lights, the blender, the air conditioning, and the TV. The breaker box, or service panel, operates as a central relay point: It takes power from the street, then feeds that power to the different electrical outlets and hard-wired appliances throughout your residence. 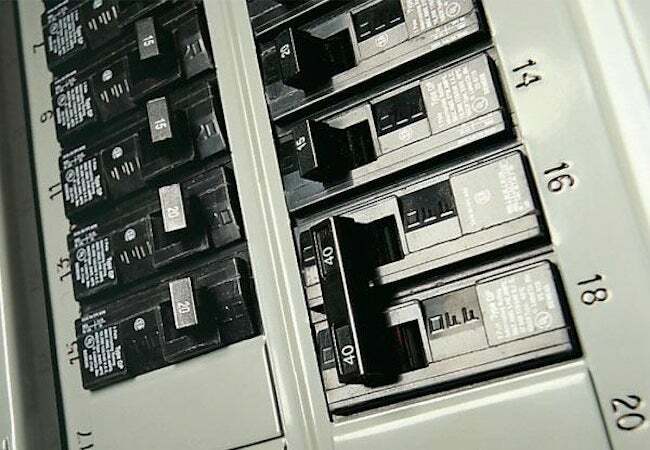 Most people open the breaker box only when there’s a problem—for example, when a circuit needs to be restored after tripping. And that’s the way it should be. Homeowners are wise to be hands-off with electrical elements, especially those they don’t understand. Make no mistake: The breaker box is dangerous. Hire a licensed electrician if you think the panel needs attention. The goal of this article is merely to explain a bit more about all of those mysterious wires and switches. At the top of the breaker box, the switch that’s bigger than the others is commonly referred to as the “main.” (Technically, it’s called the double pole service disconnect.) This is where, after passing through your electricity meter, two hot wires from the utility company hook up to your house. Each wire carries 120 volts. If you were to put this switch into the off position, the electrical current to your house would be broken and your dishwasher would suddenly stop running. Turn the switch back the other way, and your dishwasher—not to mention your refrigerator, home office computer, and bedroom alarm clocks—would come back to life. From the main breaker, each one of the two hot lines from the utility company passes into its own bus. To the eye, a bus looks like a regular metal bar. One bus runs vertically along the left side of the panel. The second bus runs vertically along the right side. A third metal bar, the neutral bus, receives the electrical current back again after it has exited the breaker box and flowed throughout your home doing its work. The circuit breakers straddle the hot bus bars, and if there’s an overload—say, from too many appliances running simultaneously—the affected circuit trips and automatically suspends the electrical current. In addition, circuit breakers serve as the origin points for the wiring that runs to different parts of your home. That’s why there are labels (with the names of rooms or major appliances) next to the individual switches. Each circuit has two hot wires feeding into the breaker, as well as a neutral wire that connects to the neutral bus. Together, these three wires exit the breaker box and go on to provide the juice for their designated circuit. • Single Pole: These consist of one switch, handle 120 volts, and can be either 15 or 20 amps. • Double Pole: Handling 240 volts with amperage ratings from 15 to 70, these look like two switches joined together. Hardwired lighting, electrical outlets, and baseboard heaters typically require 15- or 20-amp breakers. Water heaters and dryers are best served with 30 amps. Meanwhile, electric ranges take 40- to 50-amp breakers, and such things as the air conditioning system may be served by an even larger breaker or a subpanel. The wiring into a breaker must correspond to its amperage. Twelve-gauge wire suits 15- to 20-amp breakers; 8-gauge wire goes with 40- or 60-amp two-pole breakers. In the maze of wires that inhabits your breaker box, there’s one more to be aware of: the grounding wire. Typically a bare copper wire, it connects the neutral bus to a metal water pipe (or to a metal rod buried in the earth). Grounding prevents currents traveling through frayed wires from carrying on to metal surfaces they weren’t intended to reach.